Fort Wayne's meat-packing market today is controlled by Peter Eckrich & Sons and the Parrot Packing Co. But the cow's head that has silently protruded from the top of the building at 1825 W. Main St. for more than a century reminds us that it wasn't always that way. Fort Wayne's original - and for a long time the largest - meat packer was the Fred Eckart Packing House. Eckart, who supposedly came to the United States from Germany at the age of 16 with 50 cents in his pocket, opened a huge slaughterhouse and meat market in 1887 at 1825 W. Main. The building cost $25,000 to erect, and a Fort Wayne Gazette news story on Feb. 8, 1879 called the Eckart operation ``mammoth.'' The story reported 600 people were employed there. In just three months, more than 500 cattle and 10,000 hogs were slaughtered in the Eckart plant. The animals arrived in Fort Wayne by rail from Chicago. Eckart was apparently a very cautious businessman. The Gazette reported he could have made $25,000 more in the first few months of operation if he had been willing to take risks. ``But he prefers small profits to running the chance of losing money in search of big profits,'' the paper concluded. For that reason and others, the demand for Eckart meats usually exceeded the supply. Still, Eckart products were shipped in a day when most meat packers were strictly local. The plant began operations long before refrigeration was common, but it was able to store, 5,000 smoked hogs and 15,000 pickled pigs at a time. Thousands of hams were preserved in salt. 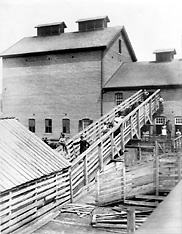 To the rear of the slaughterhouse was a huge stockyard which could hold 2,000 animals. The stockyard burned in 1949, the same year the building was purchased by The Korte Paper Co.
Like most other local industries, Eckart was hurt by the Great Depression of the 1930s. The company was hit by a strike in 1934 by employees seeking a wage of 75 cents per hour for skilled labor. Eckart was $225,000 in debt and went into receivership. The packing plant was purchased in 1940 by the Kuhner Packing Co. of Muncie, who in turn sold it to Muncie's Marhoefer Packing Co. in 1946. Marhoefer kept the slaughterhouse going until Korte came in 1949. The Eckart plant remains remarkably unaltered, even though no slaughtering has been done there in more than 30 years. Ceiling racks which once held sides of beef are still visible, and the odor of the smokehouses is still there. Brick floors with drains to carry away the blood of slaughter animals have not been paved over. Korte officers now plan to restore the building's exterior to its original appearance so that the old cow's head on the building's facade may once again feel at home.